The Swan Hill Modernisation Project (SHMP) is a staged, special project being carried out by the Connections Project. The SHMP began in 2012 and so far has made significant progress. This includes upgrading Fish Point Weir and lowering the Little Murray Weir; and installing native fish passages at both locations. Previous works completed under the SHMP also include converting the No. 9 Channel off-take from the Little Murray Weir to a pump station, upgrading the No. 10 pump station and constructing an interconnector between the No.9 and No. 10 channels north of Swan Hill. In May 2018, we began construction on the final stages of the SHMP – the No. 9 Channel decommissioning. Changing irrigation needs in the Swan Hill Rural City means the No. 9 Channel is no longer required. We will replace it with a modernised delivery system, which will deliver water more efficiently to landowners, whilst generating water savings. 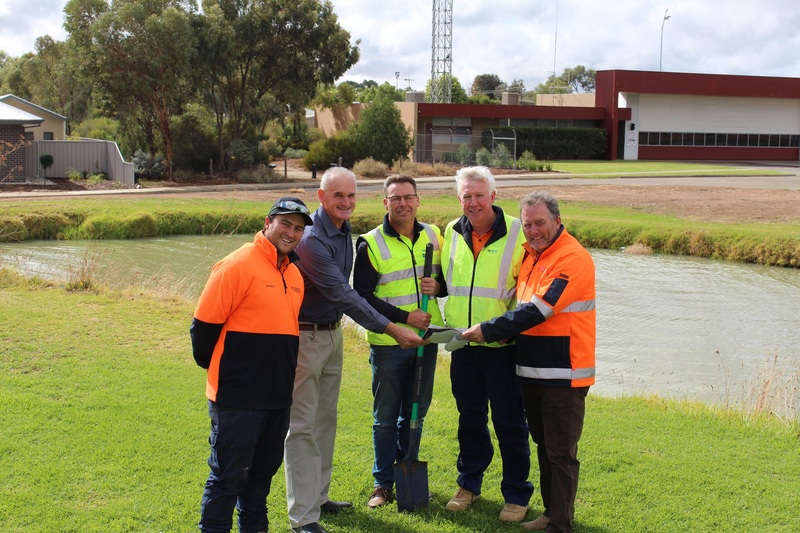 ‍Ward Bros Earthmoving’s Patrick Ward, Swan Hill Rural City councillor Bill Moar, Connections Project Swan Hill Modernisation Project’s Kendall Atkinson and Ian Wright and Ward Bros Earthmoving’s Peter Ward. This stage includes constructing a northern and southern pump station and approximately 8km of HDPE pipeline to supply customers around the Swan Hill township area. This will result in approximately 10km of open channel, which will be decommissioned and backfilled. We’re planning to carry out the majority of the construction works during our annual winter works period from May to August. Some final works following channel decommission will carry into late spring/early summer. We have appointed Rochester-based company Ward Bros Earthmoving to carry out the work. Ward Bros have begun mobilising to site in preparation while the channel is drawn down following the end of the irrigation season, with major works to begin soon after. We have a dedicated hotline for the No. 9 Channel works - should you have any questions or queries, please phone: (03) 5036 6205.